Ahoy mateys! 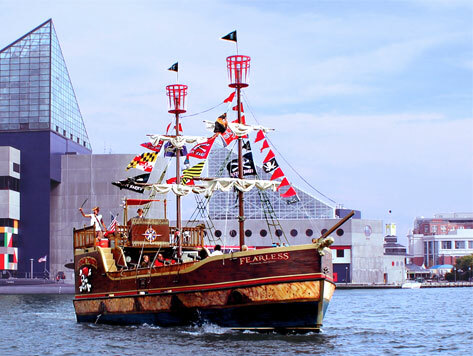 Join Baltimore’s Urban Pirates for one unforgettable adventure! Climb aboard the Fearless, and take a journey from the Ann Street Pier in Fells Point to Baltimore’s Inner Harbor. Enjoy spectacular views of downtown and interactive pirate activities such as games, songs, blasting water canons, and a stolen treasure hunt. Visitors will be given pirate costumes and make-up to dress and look the part!